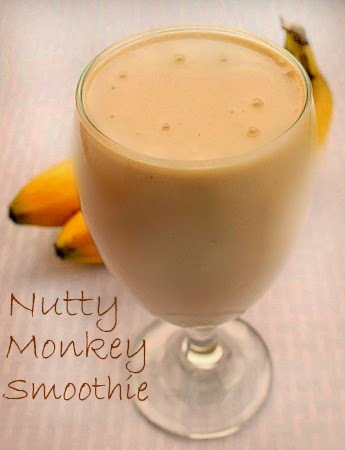 What an amazing delicious breakfast smoothie or treat this is! I found this little gem on Cabot Creamery. This is absolutely delicious! And why wouldn't it be! Greek Yogurt,bananas,peanut butter and honey along with a little milk and you've got a protein smoothie that not only you, but your whole family will love! I did make a couple of adaptions. The recipe calls for ice, I decided to freeze one of the bananas so I wouldn't need it. I also used regular peanut butter and 2% milk. The Greek yogurt that I bought was flavored with honey so I didn't have to use the 3 Tablespoons in the recipe. This is an easy, delicious smoothie that will be sure to please the whole family! Enjoy! 1. In blender, combine yogurt, ice, milk, bananas, peanut butter and honey; puree on high speed for about 45 seconds or until completely smooth. Serve immediately. Try this healthy delicious smoothie recipe. Wow how wonderful and refreshing looking! I definitely and crushing on this recipe! Hi Bunny! Was wondering if you might know how many calories or fat grams in this? It looks & sounds delicious. Good morning Heidy! Thank you for stopping by, this is one terrific smoothie! MonuTeena it is a cute name isn't it. And i must say a delicious treat too! Good morning Lauren, I loved that too! Thank you for stopping by! I love the name of the smoothie and looks so refreshing!